It was billed as the Big New Year’s Match Race. In the absence of Stakes action this weekend, another showdown between Double Grand Prix Champion Dongbanui Gangja and Busan Metropolitan and KRA Cup Classic winner Tough Win was set up to send racing fans into the Lunar New Year holiday feeling satisfied. However, Baekjeonmupae didn’t accept that he was there to simply make up the numbers and soundly defeated the pair of them in the feature event at Seoul Race Park this afternoon. There were clues that the two stars may not necessarily have it all their own way. Dongbanui Gangja had run wide in his last few outings and, despite being equipped with a set of pacifiers for the first time, it was a brave punter who expected him to give Choi Bum Hyun an easy ride. As for Tough Win, while he could be forgiven for not staying the distance in the Grand Prix last December, his laboured win in the Busan Metropolitan suggested that he wouldn’t have it all his own way over ten furlongs. So it proved to be. Cho Kyoung Ho gunned Tough Win out of the stalls and into an early lead. He stretched away from the field to the tune of five lengths in the back straight and looked in fine shape as they turned for home. 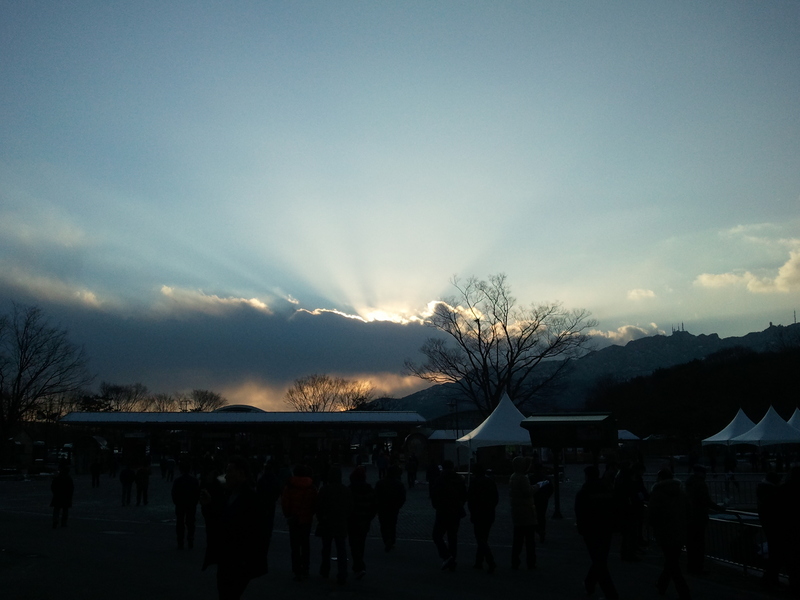 On the contrary, Choi Bum Hyun on Dongbanui Gangja looked to have given himself far too much to do having not made his customary charge round the field as they exited the back straight. All the while, Park Tae Jong was sitting poised on Baekjeonmupae in second place. 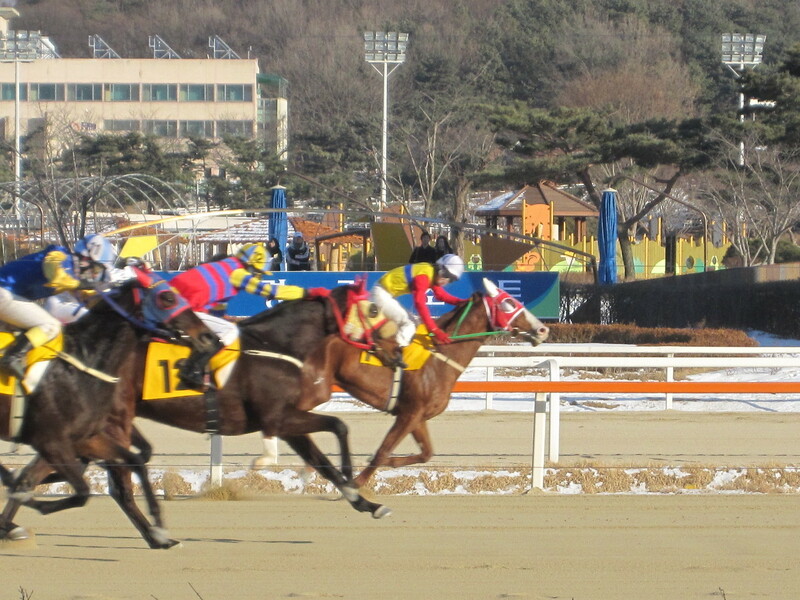 As the sprint got going, Tough Win had the rail while Baekeonmupae came down the centre. For a long while it looked as though Tough Win was going to hold on but, thirty metres from the line Baekjeonmupae drew level and a tired Tough Win succumbed to the second defeat of his career. Dongbanui Gangja, labouring under 61 kilos of weight, rallied well to finish fourth – a good sign for those who feared that his talent, along with his discipline, had gone. As for New Zealand bred Baekjeonmupae [Traditionally – Star Sixty Seven (Phone Trick)], he started as the 7/1 favourite and recorded his eleventh win from thirty-eight starts. In other races, 2010’s champion two-year old Sun Hero made his second appearance of the season. And, having disappointed in his first outing earlier in the month, he made no mistake in race 8 over the Derby distance of nine furlongs. Just like Tough Win, however, he was struggling towards the end and will have to improve if he is to feature in the Classic hunt later this year. Down at Busan, there was a six race card, the highlight of which saw young Aussie colt Wanggol (Jet Spur) look for his seventh win in ten starts. It wasn’t to be. Four year old Hudson River Line (Not For Love), who won four of his first five starts but had only one twice in ten subsequent starts, dominated proceedings as he took a two length win from old-stager Admiral Reigart. So that’s it for two weeks as next weekend racing takes a break for the Lunar New Year holiday. Very welcome the break is too as we leave a January in which not a single day has recorded a temperature above 0C. Hopefully by the time we reconvene in a fortnight’s time, horses, jockeys and punters alike, will find a much more agreeable climate. Today, however, we saw our champion – our reigning Horse of the Year – humbled. He’ll be back and all Tough Win’s defeat really does is open up the question of just who it is who is going to take that crown this year. In our wonderful sport, there is always something to look forward to. 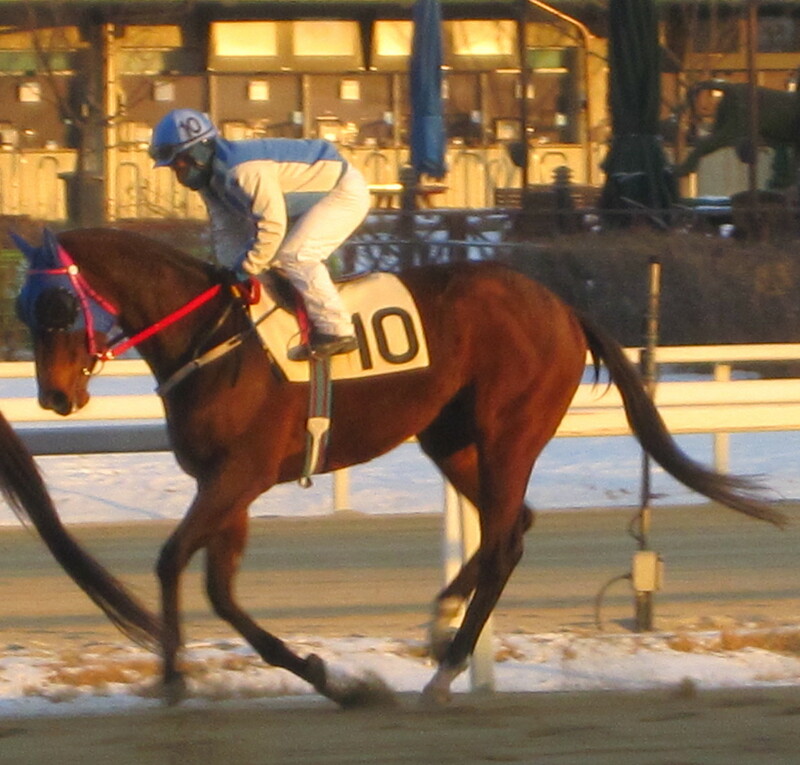 Triple Seven returned to form while Special Volpony found hers at last as the pair took home the big prizes in co-feature races at Seoul Race Park this afternoon. Thinking up various ways of saying “it was very cold” has become tedious but, suffice to say, it was once again extremely cold on a day which saw thirteen races run with last Sunday’s abandoned feature race added to the card. That was Triple Seven’s race and the current Ttukseom Cup holder was back to his best to see off a field containing Oaks runner-up Cheonun and pre-race favourite Blue Pin. Blue Pin managed second but Cheonun was a disappointing sixth. One race earlier, 12/1 shot Special Volpony scored her first win at class 1 at her first attempt, in the process landing apprentice jockey Park Sang Woo his own first triumph at the elite level. Fourth to Love Cat in the Nonghyup last year, she made the most of a light weight to win by just over a length from outsider Jeokdaejeok. Love Cat and pre-race favourite Lucky Mountain were both well-beaten. In other races there was a New Zealand exacta in race 10 as Baekjeonjeonseong (Traditionally) – a horse who appears to have at least one too many syllables in his name – got the better of fellow Kiwi born Super Yongwang (Ekraar). 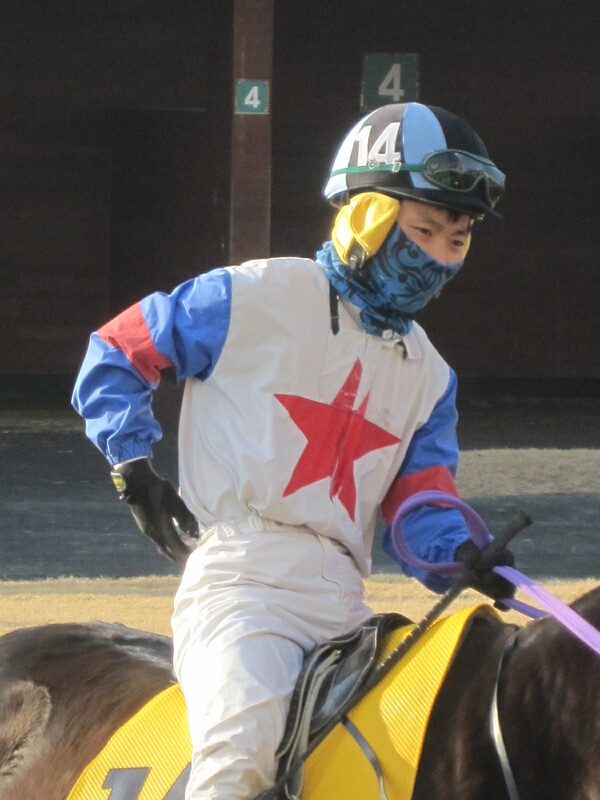 Meanwhile much earlier in the day, while it may have taken apprentice jockey Park Jong Hyun seven months to ride her first winner, it hasn’t taken her so long to grab her second. Park guided 16/1 shot Paxgo to victory in race 3. Also breaking their maidens today were US bred A Wanted Affair (Ten Most Wanted) and Strodes Creek colt Sen Wang. Three year old Sen Wang is one of the last foals to have been sired by Strodes Creek, who died in a paddock accident in January 2008. Racing returns to the capital on Sunday when it is the big match; Dongbanui Gangja vs Tough Win. Tough Win has just officially been named Horse of the Year for 2010 and he’ll be odds-on to start 2011 on a high. There are eleven races at Seoul from 11:20 to 18:00 and six at Busan from 12:40 to 16:30. It’s Tough Win vs Dongbanui Gangja at Seoul while Minister’s and President’s Cup winner Dangdae Bulpae goes at Busan on what is set to be another action packed weekend of racing in Korea. It’s true that 2010’s much hyped battles between double Grand Prix winner Dongbanui Gangja and young upstart Tough Win fell a little flat. Dongbanui Gangja had always been difficult to control, but in the Busan Metropolitan he ran so wide on the final turn that he was able to play no part in the finish as Tough Win triumphed. Next was the KRA Cup Classic when, while Dongbanui Gangja kept straight Tough Win soundly beat him. Finally in the Grand Prix, the unbeaten but unheralded Mister Park came up from Busan and in the season’s longest race, handed them both a thorough drubbing. Tough Win didn’t manage to say the distance that day, but he’s back down to ten furlongs on Sunday as he meets Dongbanui Gangja again. With a two kilo weight advantage, he’ll be strong favourite to get back to winning ways. 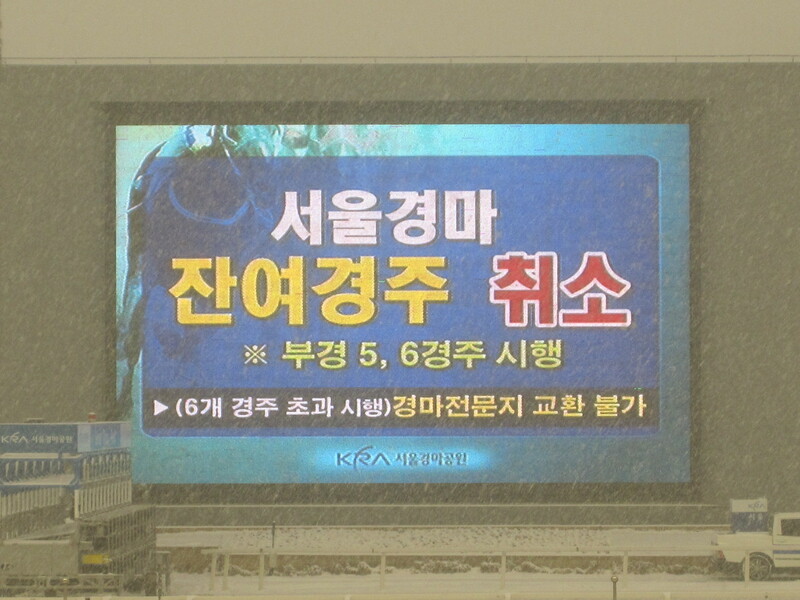 Saturday sees a thirteen race card at Seoul with last week’s snowed off Sunday feature being re-arranged. Good Day, Cheonun, Triple Seven and Blue Pin all survive from the original line-up. In what’s now a co-feature event, Lucky Mountain and last year’s champion filly or mare Love Cat are among a full field of fourteen contesting a class 1 handicap over nine and a half furlongs. Down at Busan, one of the peninsula’s top horses returns to action. Dangdae Bulpae also failed to stay the distance in the Grand Prix last year but did land the President’s Cup, Korea’s richest race. On Friday, he runs at his home track of Busan for the first time since last September as he takes on another full field in the feature race. He’s a class apart from any of his rivals, but will have to carry eight kilos more than any of them . Only the weight can beat him. 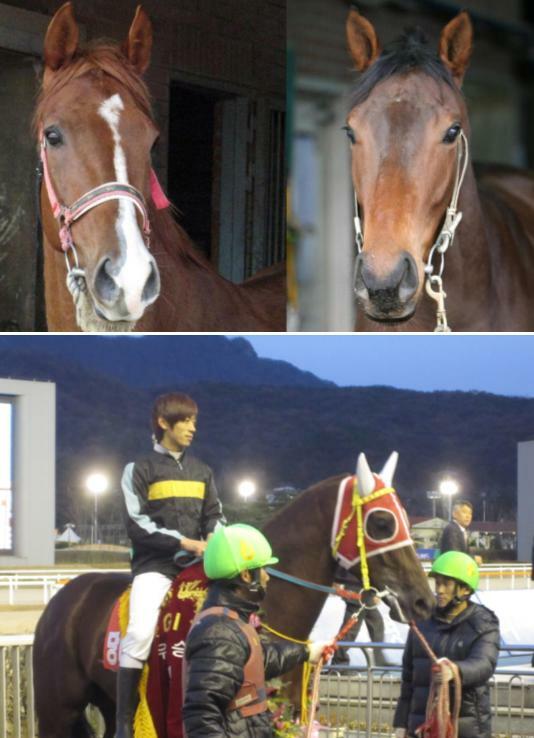 Also down in South Gyeongsang Province on Friday, we’ll be looking out to see how Lion Santa (Lion Heart) fares in his first outing at class 2. The three-year old was one of last year’s hottest imports and has won all of his four races to date. Racing Queensland announced last week that it has set up a trust fund for the family of Chief Steward James Perry who was lost in the recent Queensland floods. James served as a Steward at Seoul Racecourse for two-and-a-half years from the beginning of 2008 until September 2010 when he took the decision to return to his native Australia. With racing in Korea always taking place on a Saturday and Sunday, he needed more weekend time to spend with his family. He was held in very high regard in Korea. * A memorial service for James Perry will be held in the Chapel next to the Robb Hall at Seoul Foreign Middle School at 2pm on Friday, simultaneous with a service in his native Sydney. 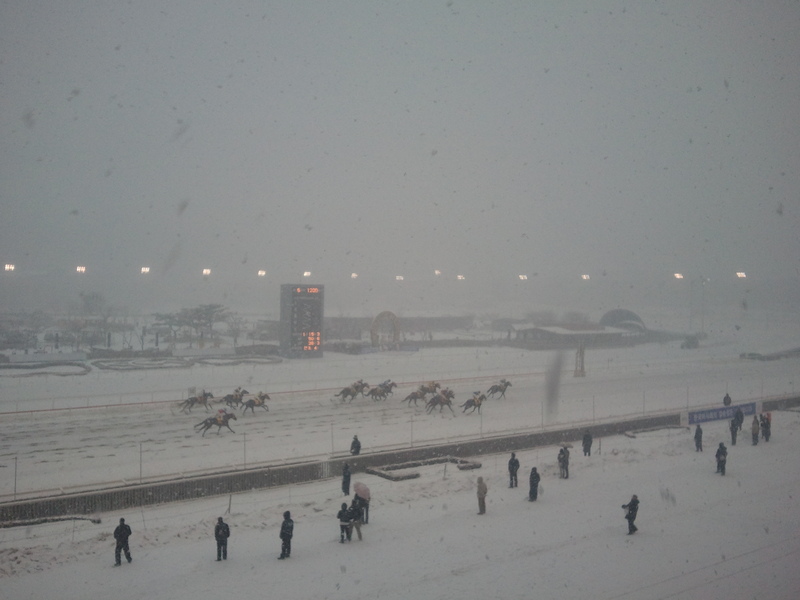 A full-on blizzard mid-way through the card caused racing at Seoul to be abandoned this afternoon. Six races had been completed by the time the decision was made that conditions were no longer safe. While there had been a few flakes drifting in the air when racing got underway at 11:20 this morning, there was little indication of what was to follow. 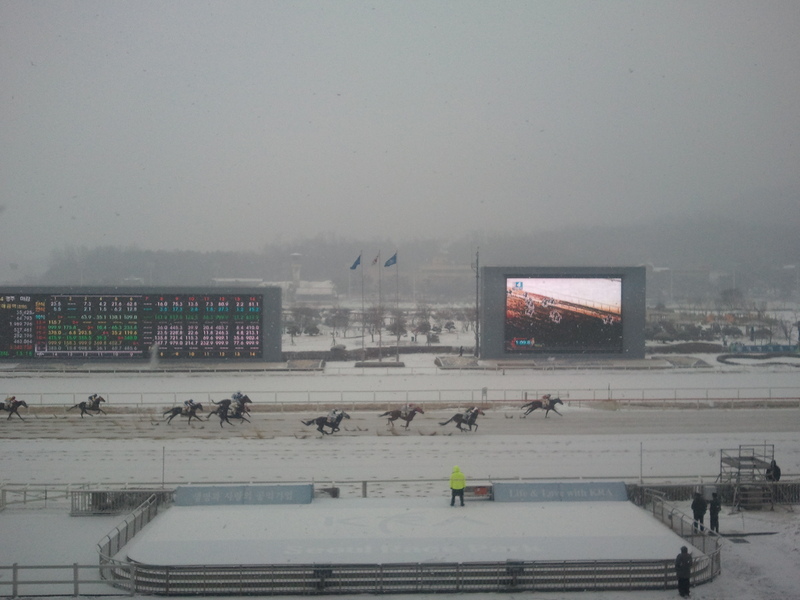 By race 4, snow was falling steadily and then settling on the track. With the driving blizzard limiting visibility, the floodlights were switched on after race 5, however, with the horses at the post for race 6, jockeys dismounted while as much snow was cleared from the track as possible. They got back on and Park Tae Jong guided favourite Yeongung Icheon to a victory that could be barely made out on the TV cameras, let alone by the punters sheltering in the grandstand. While efforts were made to continue, it quickly became apparent that such was the volume of snow, horses were finding it difficult to walk in the paddock, let alone on the track. Shortly after 3pm, it was announced that racing was abandoned for the day. 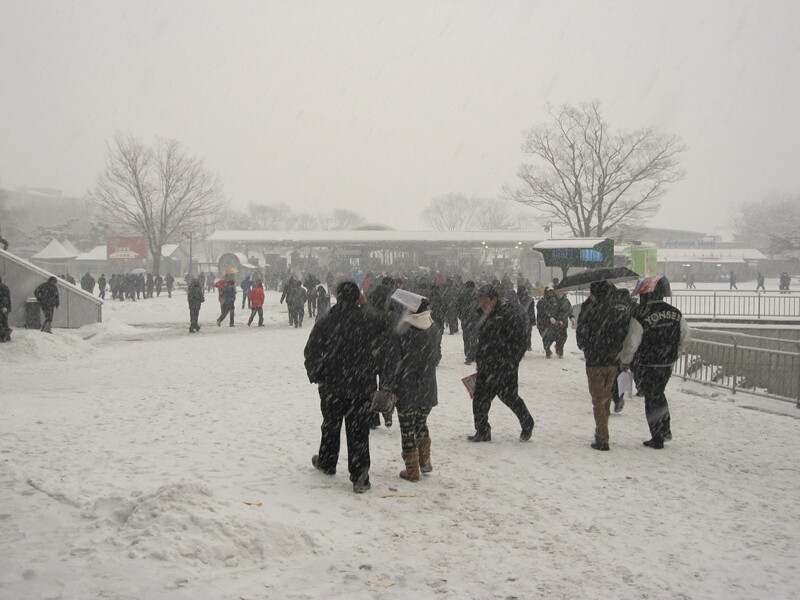 Unlike the last time this happened, there were no near-riots from punters – the time of day and the obviously dreadful conditions contrasting with the day in 2009 when in bright sunshine and with punters having just paid their entry fee, the track was deemed to be frozen. 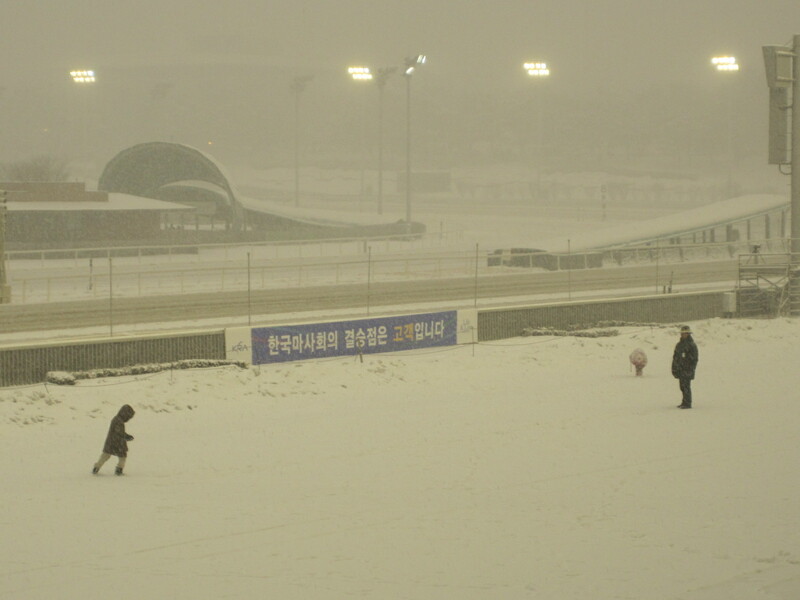 Seoul’s abandonment meant that all eyes were shifted south to Busan for the southern track’s co-feature races. In the first of them, favourite Areumdaun Jilju put in a disappointing run as Deep Desire took the honours. The four-year old led home rank outsider Boulogne by just over half a length to record the sixth win of his twelve race career. 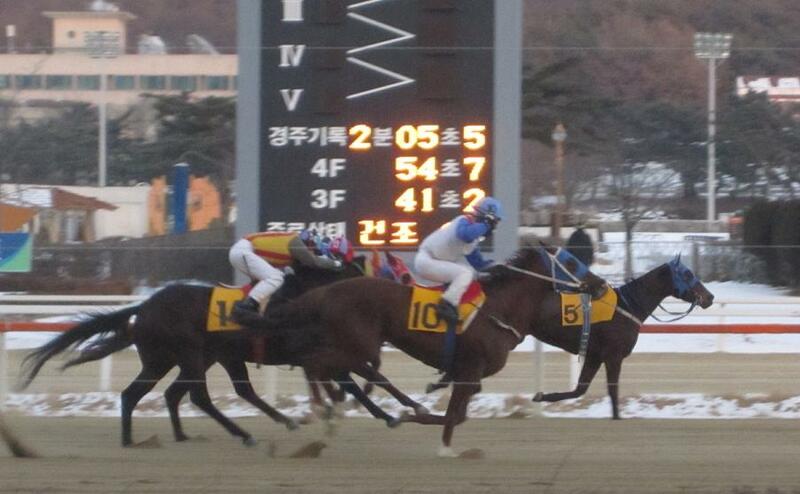 That race was restricted to Korean breds but the finale was open to all. Yeonseung Daero, despite being eligible for the domestic races, was sent out against foreign opposition. And as he usually does, he beat them. Now five-years old, Yeonseung Daero was well-placed throughout and pounced with just over a furlong to go to win by a length and a half from Heukjanggun and Haengbok Dream. 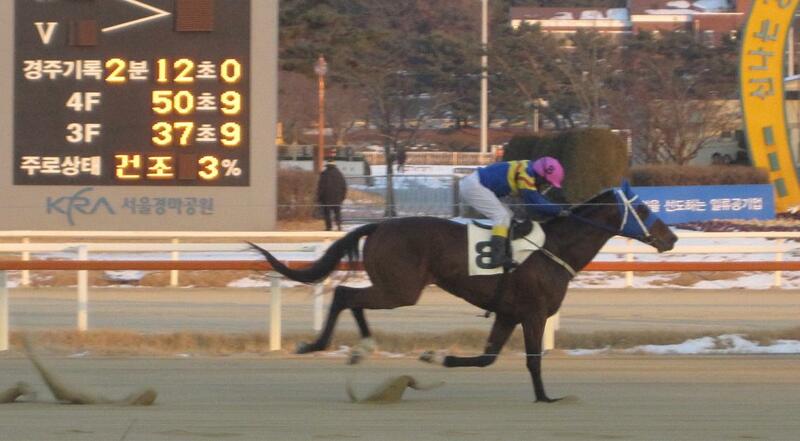 Korean racing needs more horses to be campaigned the way Yeonseung Daero has been. His career record reads just twelve wins from twenty eight starts. However, since turning four, he has only competed in races restricted to Korean bred horses twice – both Major Stakes races. Instead of harvesting comparatively easier handicaps, he’s taken on the best of the imports, culminating in his third place finish in the Grand Prix at Seoul last month. So that’s racing over with for another week. We never got to see Cheonun take on Triple Seven in Seoul’s feature but all those abandoned races will be rescheduled as additions to forthcoming cards. 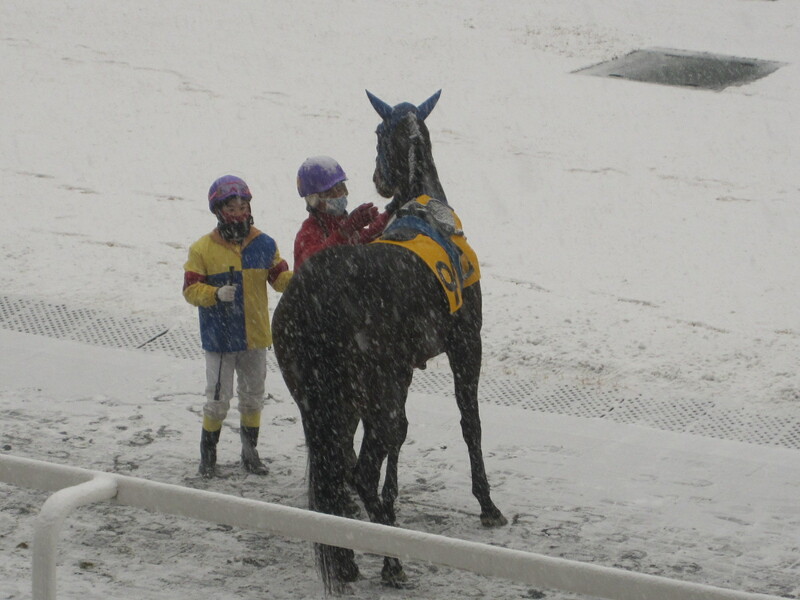 On another cold day of racing in the Korean capital, it was five-year old Necromancer who ran out winner of the feature Handicap. 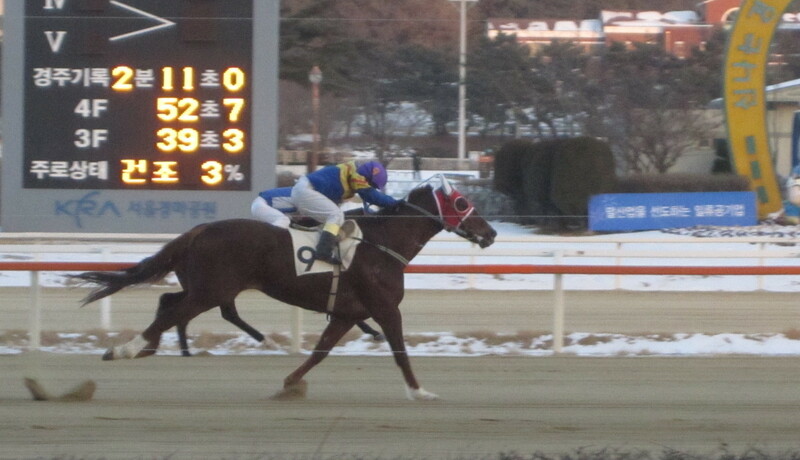 The Japanese bred gelding beat out a competitive field of fourteen to win by three lengths under jockey Park Tae Jong. Bally Brae’s little brother Jumong was sent off as favourite for the ten furlong main event but he struggled to make any impression as Necromancer [Air Eminem – I Am The Filly (Symboli Rudolf)] took the lead two furlongs out and cruised home ahead of Dr. Twobillion (Eddington) and Victory Town (Delaware Township). It was only the fifth win of Necromancer’s twenty-five race career and his second at class 1. While it was another sub-zero day, the lack of any wind made conditions far more pleasant than they had been a week ago and a healthier Saturday crowd was on hand for a day of relatively low-key racing. There was little action on the three-year old front as although Mustang King (Menifee) put in a good performance in race 5 to record his second win from five starts but neither his time nor opposition suggested that he’ll be among the favourites on the Derby trail. Meanwhile, champion jockey Cho Kyoung Ho was the pick of the riders, landing a treble while Yang Hee Jin scored a rare double. 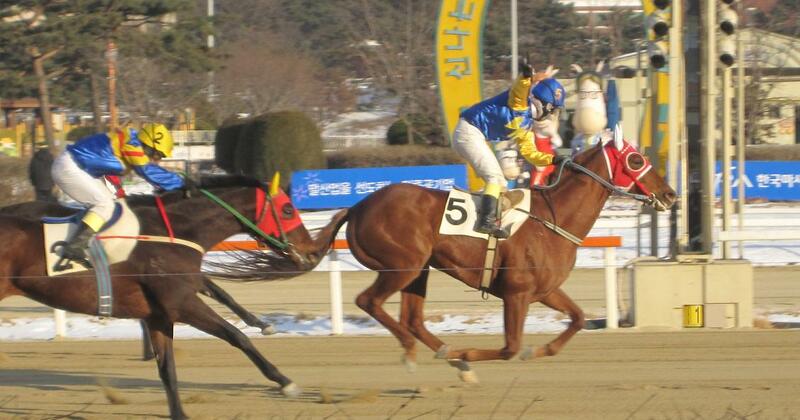 Meanwhile Kim Hae Sun continued her solid start to 2011 by winning on Blue Charming in race 3, her only mount of day. Racing returns to Seoul on Sunday with an eleven race card from 11:20 to 18:00. Down at Busan there are six races from 12:40 to 16:30. Last year’s Ttukseom Cup winner Triple Seven faces Oaks runner-up Cheonun in Seoul’s feature while Areumdaun Jilju and Yeonseung Daero headline co-features at Busan.